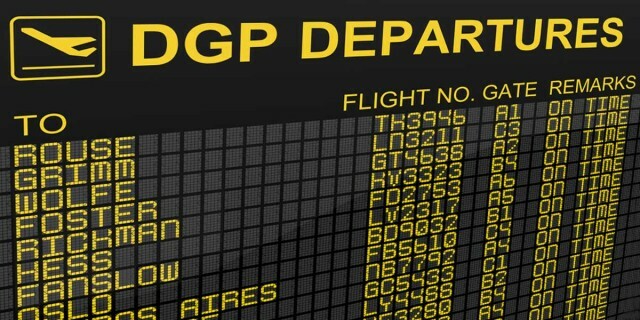 The second article of the series on DAM expectations, this article outlines the critical gap that often occurs when selecting and implementing a DAM system to manage digital assets, without recognizing the minimum viable people, process and information architecture that must be in place in order to realize a satisfactory return on investment. 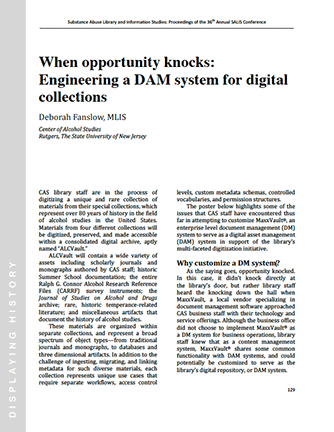 This article is the first in a series focused on the need to manage expectations of leadership and stakeholders around the requirements of managing digital asset collections effectively in order to avoid a failed DAM implementation. Understanding the asset life cycle and the need for active curation throughout the entire cycle is described as a prerequisite for success. This article was published as part of Picturepark's Librarian Tips for DAM Managers series. 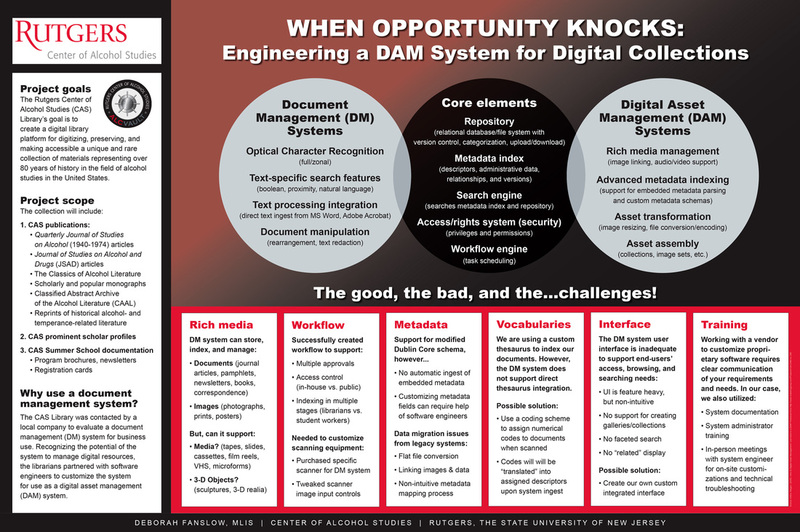 Written for the digital asset management community, this article provides suggested education resources on topics related to DAM, as well as tips for uncovering more elusive academic resources from within the LIS community. Who Needs a DAM Librarian? This series of articles was published in DAM News as a response to an article authored by David Diamond that called for librarians to advocate for the value they bring to DAM. This case study was published in the inaugural issue of the Proceedings of the 36th Annual SALIS Conference. The article details a case study of the custom DAM implementation I was involved with at the Rutgers Center of Alcohol Studies Library. The accompanying poster (below) was initially presented at the 2014 SALIS conference, and won an award at the Center of Alcohol Studies student poster exhibition.